As a part of 22nd anniversary celebration, PT. Indmira holds a family gathering at Panjiwo Mungkid restaurant on Saturday, 10 November 2018. This celebration involves only the employees of our company and the subsidiaries. With the theme “Working with Heart”, we hope to maintain and strengthen our collaborations to achieve our goals by cultivating strong teamwork, training team coordination, developing good strategies, and cultivating fortitude. A series of fun activities are planned to fill this family gathering consisting of paintball competition, games, and rafting. Taking group pictures starts the day filled with fun poses to awaken everyone’s excitement. Paintball fights are the first active actions. Teams are formed randomly across divisions and work groups. A paintball fight is not only fun, but also an opportunity to hone on teamwork, coordination, and strategy. People have to take turns for the paintball fight. However, the day is never boring. There is a game to fill the time for those who are not playing paintball. The game involves dribbling a ball through PVC pipes to enter a bucket. The games stop at lunch time for meals and midday prayer. After enough rest, rafting commences in the afternoon. It takes place in the Oyo river. 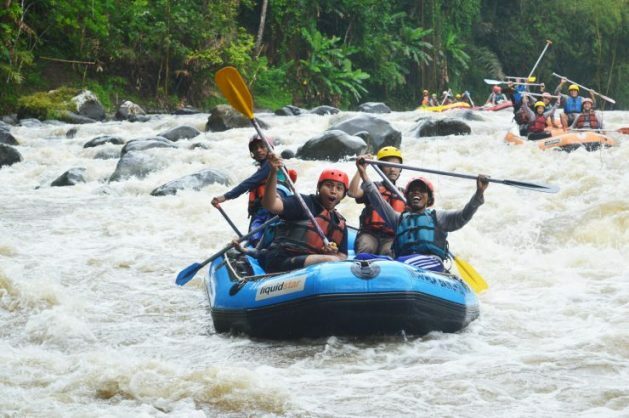 Eventhough the rain comes during rafting, everyone is enjoying the activities fully. After the fun in the river, everyone returns to Panjiwo Mungkid restaurant to rest, play more games, and receive door prizes. The gathering is closed with the showing of a short video on the experiences of employees. We hope that our 22nd anniversary celebration will bring everyone closer together to develop into stronger company with strong work ethics. This increased work ethics should not only be increased work, but working wholeheartedly to improve agriculture in Indonesia. (Communication & Business Strategic Division).